It has been four months since President Barack Obama announced the November 20 immigration directives, which, among other common-sense immigration solutions, build on the Deferred Action for Childhood Arrivals, or DACA, program announced in June 2012. 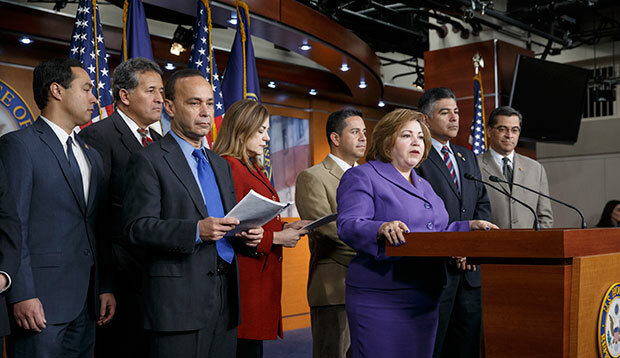 The November 20 directives expand the population eligible for DACA and establish a new policy called the Deferred Action for Parents of Americans and Lawful Permanent Residents, or DAPA. These programs provide eligible undocumented immigrants a temporary reprieve from deportation and the ability to work lawfully for a temporary period of time. A number of entities—including the Congressional Budget Office, the Social Security Administration, and the Council of Economic Advisers—have analyzed the November directives and found that the policies will produce an array of positive economic and fiscal benefits. In this column, the analysis of the Center for American Progress zeros in on the estimated potential economic gains specifically associated with DACA and DAPA. In 2013, CAP published a report that estimated the effect of legal status and citizenship for the 8 million undocumented immigrants in the labor force. This column adopts the same methodology, updating it to fit the population eligible for a temporary reprieve from deportation through the three deferred action programs—the original DACA, the DACA expansion, and DAPA. So why will the United States be better off economically when this eligible population receives deferred action? The answer is straightforward: When approximately 5.2 million individuals are able to work legally and live without fear of deportation, they will have greater opportunities to find new jobs that match their skillsets and will be even more economically productive. Their lawful work authorization will make them less vulnerable to wage theft and workplace exploitation. These factors all lead to higher wages and more job security, which translate into more tax revenue generated and more economic activity across the nation. This analysis confirms that there is much to gain economically from enabling the DACA- and DAPA-eligible population to work lawfully. As DACA and DAPA recipients earn higher wages—an estimated total of $103 billion more over the next decade—the U.S. gross domestic product, or GDP, will increase cumulatively by $230 billion over the next 10 years. And it is not just beneficiaries of deferred action who will see wage gains: A booming economy will increase the incomes of all Americans by an estimated $124 billion. The growth in economic activity will also create an average of 28,814 jobs per year over the next 10 years for all Americans. These much-needed economic boosts to the economy are consistent with earlier estimates of large tax increases from the immigration directives: The Social Security Administration, for example, projects that the November directives alone will add $41 billion in new tax revenue to the system over a decade. Similarly, a recent CAP study estimates that the temporary work permits could potentially raise payroll tax revenues by $22.6 billion over five years. This analysis assumes that there are approximately 5.2 million immigrants eligible for DAPA and DACA, including the DACA expansion. We apply the general estimates of the number of undocumented immigrants in the labor force—72 percent of the total population—to get 3.7 million potential deferred action beneficiaries in the labor force. Unlike the Department of Labor’s previous estimate—which found that immigrants experience a 15.1 percent gain in income after moving from undocumented to documented status—this analysis uses the 8.5 percent wage gains from CAP’s earlier study, since deferred action is a temporary program. We apply these assumptions and phase in the 8.5 percent increase over the first five years, with the full 8.5 percent gain applied over the latter five years. 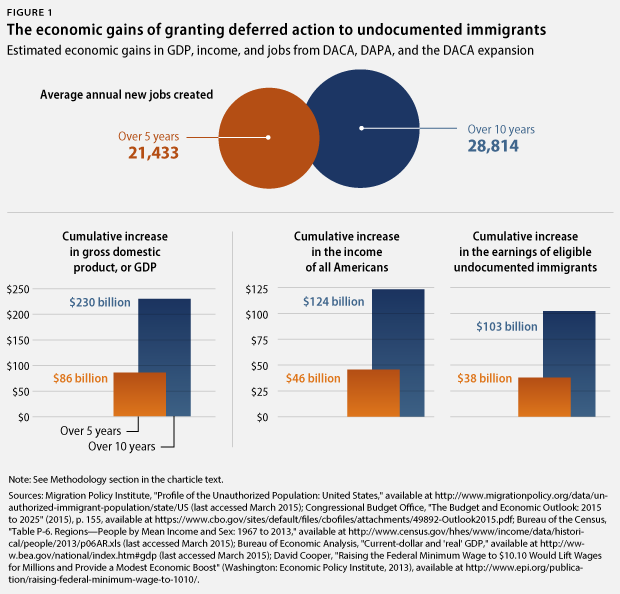 For a detailed discussion of the methodology, see Robert Lynch and Patrick Oakford, “The Economic Effects of Granting Legal Status and Citizenship to Undocumented Immigrants” (Washington: Center for American Progress, 2013), available at https://cdn.americanprogress.org/wp-content/uploads/2013/03/EconomicEffectsCitizenship-1.pdf. Last December, 26 states—led by Texas—filed a lawsuit targeting the DACA expansion and the DAPA program. In February, Judge Andrew Hanen of the Southern District of Texas issued a preliminary injunction in the lawsuit, temporarily blocking these programs. He concluded that the states had standing to file suit because these programs will impose costs on Texas from issuing driver’s licenses to DACA and DAPA recipients. In making this determination, Judge Hanen neglected to consider the economic and fiscal benefits that DACA and DAPA will potentially generate. The Department of Justice, recognizing the big economic benefits from these deferred action programs, filed for an emergency stay at the 5th Circuit Court that asked to lift the judge’s ruling, and 14 states and the District of Columbia have filed an amicus brief in support of the stay. The current analysis and other estimates that reveal the large economic gains from deferred action cast doubt on Judge Hanen’s ruling and the claims of economic harm to the states. The Texas lawsuit, as well as other legislative efforts to block DACA and DAPA, are fiscally and economically counterproductive. And yet even the ample economic benefits to the nation that would result from providing deferred action to certain undocumented immigrants pale in comparison to those that would come with comprehensive immigration reform that includes a pathway to citizenship. Rather than fighting this important—and temporary—administrative step, Congress and the states should be pushing for a lasting legislative solution that will realize the full economic potential of a 21st century immigration system. Silva Mathema is a Policy Analyst on the Immigration Policy team at the Center for American Progress. She would like to thank Robert G. Lynch, Marshall Fitz, and Philip E. Wolgin for their invaluable input.